A gold bar is a quantity of refined metallic gold of any shape that is made by a bar producer meeting standard conditions of manufacture, labeling, and record keeping. Larger gold bars that are produced by pouring the molten metal into molds are called ingots. Smaller bars may be manufactured by minting or stamping from appropriately rolled gold sheets. The standard gold bar held by central banks and traded among bullion dealer is the 400-ounce (12.4 kg) Good Delivery gold bar. 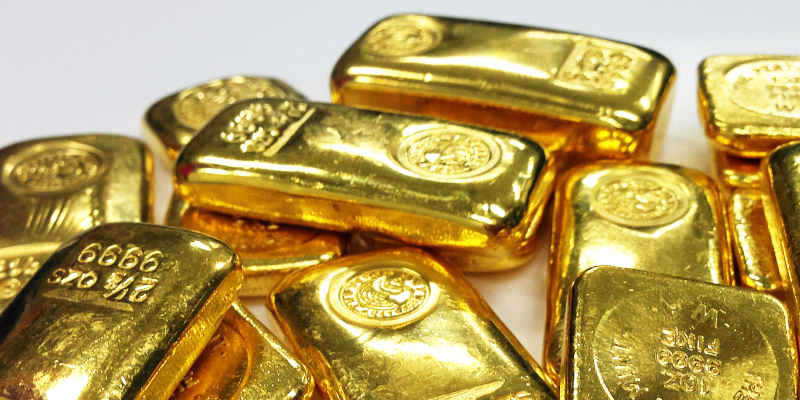 Gold bars are classified into two different types, casted and minted, based on their method of manufacturing. Cast bars are made by pouring molten gold into an ingot mold to shape the gold product. Minted bars are made from gold blanks that have been hand cut to the required dimensions from a flat piece of gold. Markings are almost always applied by presses. ChipGold is a relatively new form of gold bar consisting of a small ingot (1-20 grams) in a sealed and certified package the size of a credit card. 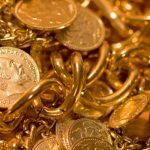 Gold is measured in troy ounces, often simply referred to as ounce when the reference to gold is evident. One troy ounce is equivalent to 31.1034768 grams. The much more commonly used avoirdupois ounce is used for measuring weights in most situation in daily life in countries using imperial measures. An avoirdupois ounce is lighter than a troy ounce; One avoirdupois ounce = 28.349523125 grams. The standard gold bar held and traded internationally by central banks and bullion dealers is the Good Delivery bar with a 400 oz. nominal weight. However, its precise gold content is permitted to vary between 350 oz and 430 oz. The minimum purity required is 99.5% gold. These bars must be stored in recognized and secure gold bullion vaults to maintain their quality status of Good Delivery. The recorded provenance of this bar assures integrity and maximum resale value. One tola = 11.6638038 grams. One tael = 37.429 grams. TT (Ten Tola) = 117 grams (3.75 oz). Tola is a traditional Indian measure for the weight of gold and prevalent to this day. Many international gold manufacturers supply tola bars of 999.96 purity. An ingot is a material, usually metal, that is cast into a shape suitable for further processing. Non-metallic and semiconductor materials prepared in bulk form may also be referred to as ingots, particularly when cast by mold based methods. Ingots require a second procedure of shaping, such as cold/hot working, cutting or milling to produce a useful final product. Additionally ingots (of less common materials) can be used as currency, or as a currency reserve as with gold bars. Metal, either pure or alloy, heated past its melting point and cast into a bar or block using a mold chill method. Polycrystalline and single crystal ingots are made from semiconductor materials by pulling from a molten melt. Uses include the formation of photovoltaic cells from silicon ingots by cutting the ingot into flats, known as wafers. Single crystal ingots (called boules) of materials are grown (crystal growth) using methods such as the Czochralski process or Bridgeman technique. The boules may be either semiconductors—for the electronic industry, or non-conducting inorganic compounds for industrial and jewellery use, e.g., synthetic ruby, sapphire etc. Single crystal ingots of metal are produced in similar fashion to that used to produce high purity semiconductor ingots, i.e. by vacuum induction refining. Single crystal ingots of engineering metals are of interest due to their very high strength due to lack of grain boudaries. The method of production is via single crystal dendrite and not via simple casting. Possible uses include turbine blades. In the United States, the brass and bronze ingot making industry started in the early 1800s. The US brass industry grew to be the number one producer by the 1850s. During colonial times the brass and bronze industrial was almost non-existent because the British demanded all copper ore be sent to Britain for processing. Copper based alloy ingots weighed approximately 20 pounds (9.1 kg).